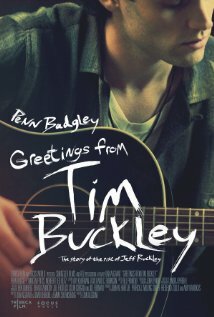 Greetings from Tim Buckley follows the story of the days leading up to Jeff Buckley's eminent 1991 performance at his father's tribute concert in St. Ann's Church. Through a romance with a young woman working at the concert, he learns to embrace all of his feelings toward the father who abandoned him - longing, anger, forgiveness, and love. Culminating a cathartic performance of his father's most famous songs, Jeff's debut stuns the audience and launches his career as one of the greatest young musicians of his time. I wasn't expecting much with this movie--as you are unable to capture a moment that occurred for a few seconds and stretch it for almost 2 hours. There were too many blank spots in this movie--where the character of Jeff walked around moping or just staring at a wall--if I knew that I would be witnessing someone watch paint dry I would've waited until I could illegally download this movie so none of my money would have been wasted. There was no story line--for people coming into this blindly not knowing who either Tim Buckley or Jeff Buckley are, this movie doesn't clarify anything--you don't know who either are or why their relationship is strained, etc, etc. I understood this movie because I already know about the storybut for new comers they will be lost. Who is Gary Lucas? Who is Hal Willner? Who is Mary? Who is Lee Underwood? Obviously the writers of this movie and the director only just wanted to "get to the point" but have forgotten that in order to get to the point and the ultimate buildup you must first have a story that leads you there. The singing by Penn Badgley was actually descent and all due respect he's got a great voiceI like how he didn't try to sound like Jeff Buckley but he did try to sound descent and show off his abilityso all credit definitely goes to that. What ruins this movie is the lack of story, and most importantly factsand we can't blame the actors for that. Overall it wasn't great anymore than it was goodso if you want to watch the movie, you're better off settling with the trailer it gets to the point and doesn't make you sit and waste your time for an hour and 45 minutes.